For all of the green living tips I'm sharing this month, I want to make sure it's something that I've done myself. If I've done it, I can tell you with all sincerity that you can do it too! My life is too complicated and busy to take on projects and efforts that are more work than they are worth. So today's green tip is one that is a relatively low cost and super simple to do - just minutes really. Change your shower head to a water saving variety. This only takes a quick trip to your local hardware store. We chose the WaterPik EcoFlow - which you can also purchase online. 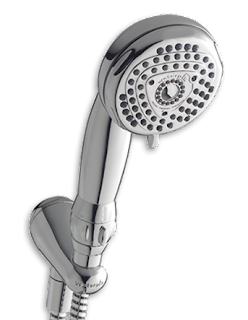 It's as easy as taking out the old shower head and replacing it with the new one. You may need a good wrench if the old threads are sticking, and it never hurts to use plumbers tape to give an extra tight seal, but that's about it for equipment.